Home > Libyan Desert Glass > Authentic Libyan Desert Glass JEWELRY > Libyan Desert Glass 14K Gold Jewelry Pendant - Sold! Libyan Desert Glass 14K Gold Jewelry Pendant - Sold! 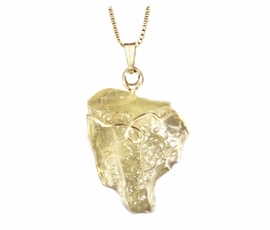 This is a totally awesome piece of all natural Libyan Desert glass. It is shaped somewhat like an ice cube and has many dimples and a whole lot of character that makes Libyan Desert Glass so special and unique. What is Libyan Desert Glass? Libyan Desert glass is the ejected, melted and then cooled coalesced glass ventifact droplets that are the remains of what was once an asteroid, comet, or meteorite space rock that collided with the Libyan Desert 26 million years ago. From that event the heavens rained backed to earth these all-naturally formed beautiful yellow droplets, only found in the Libyan Desert. They are solitary remains that speak of a vanished era long ago when a space invader pummeled the region nowadays referred to as the Libyan Desert. 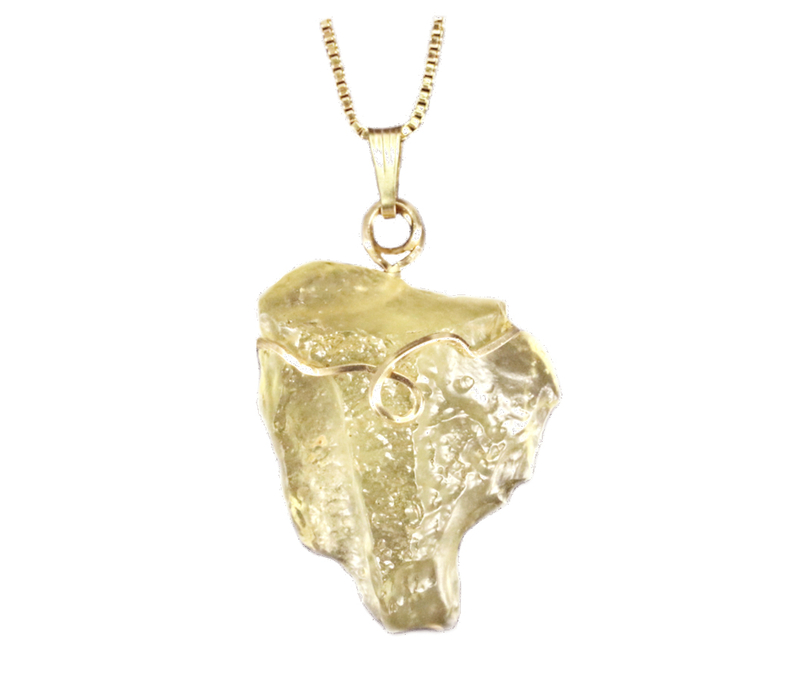 We have fashioned these beautiful, froth-like yellow gemstone droplet, discovered and gathered by explorers and Bedouins to the region, into this outstanding fine cosmic jewelry. Archaeologically, it was so valued by the ancient Egyptians to have been placed as the centerpiece gemstone on the breastplate of King Tut! Size: 18.2 grams; Size: 2 1/4"L X 1 3/8 "W X 1/2"D, Chain not included. Ships with a Certificate of Authenticity, quality black velvet jewelry box and information about the jewelry. This Libyan Desert Glass was legally collected before 1970.